From concerts to parties to dinners, Nashville is a prime destination to ring in the new year. Whether you’re a local or visitor, this is your ultimate guide to New Year’s Eve 2018-2019 in Nashville. Here are some of the best places to celebrate on Monday, December 31, 2018. All-inclusive options with an open bar are noted in neon teal. We’ll be adding more events as they are announced. Submit NYE celebrations for consideration here.  See more places to stay. 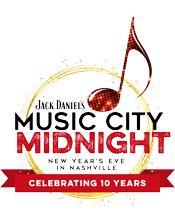 The city’s main celebration, Jack Daniel’s Music City Midnight, will take place on Monday, December 31, 2018, starting at 4:00pm at Bicentennial Capitol Mall State Park, featuring performances by Keith Urban, Peter Frampton, Judah & The Lion, Caitlyn Smith, Devon Gilfillian, and the Fisk Jubilee Singers. The evening is filled with free live music, fireworks, confetti, and the Music Note Drop® at midnight. FREE | Get more details. 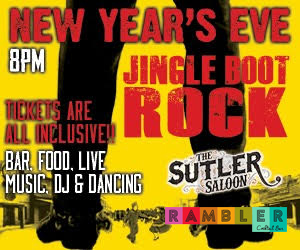 The Sutler and Rambler Cocktail Bar are hosting their annual, all-inclusive Jingle Boot Rock New Year’s Eve Party on Monday, December 31, 2018, from 8:00pm to 1:00am. All tickets include an open buffet and open bar all night with a complimentary champagne toast and boot drop at midnight. There will be two levels of entertainment with the option to purchase seats or tables at The Sutler or Rambler. This event is 21 and over only. $130+ | Get more details. 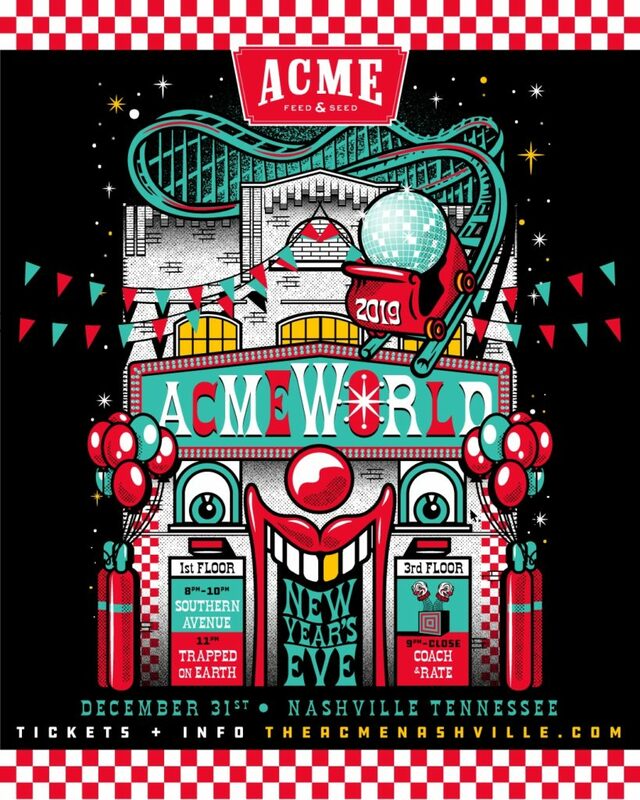 Acme Feed & Seed is hosting AcmeWorld from 7:00pm to 2:00am on Monday, December 31, 2018. Expect fun music, balloon drops, photo booths, confetti, and a champagne toast at midnight. The first floor will feature live music sets by Southern Avenue and Trapped on Earth, and the third floor will feature dance music from DJs Coach & Rate starting at 9:00pm. Tickets are $60 for general admission. VIP booths are also available for groups up to 14 people. This event is 21 and over only. Re-entry isn’t allowed. $60+ | Get more details. New Year’s Eve at Noelle is from 9:00pm to 1:00am on Monday, December 31, 2018. There are three ticket levels, including General Admission, Gold Level, and All-Access VIP. The Trade Room lounge is open to all ticket holders and will feature DJ Foldy and dancing from 9:00pm to 1:00am. Upgrade your experience to get access to Hidden Bar’s disco dance party with DJ Majik, or get All-Access VIP for the private black tie martini lounge, raw bar, and complimentary casino games. $50+ | Get more details. L27 Rooftop Lounge located on the top of the Westin Nashville hotel will ring in 2019 with music, bubbles, bites, and an incredible view. A Toast to the New Year is from 9:00pm to 2:00am on Monday, December 31, 2018. Tickets start at $150 and all tiers include food, cocktails, and a champagne toast. Guests will also enjoy jazz music from the Jody Nardone Jazz Trio from 9:00pm to 11:00pm followed by dance music from DJs Case and Pia until 2:00am. $150+ | Get more details. 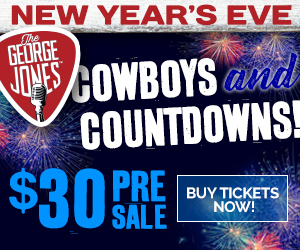 The George Jones Presents: Cowboys and Countdowns on Monday, December 31, 2018, from 6:00pm until 2:00am. Tickets to Cowboys & Countdowns (which does not include access to the Chase Bryant concert) are $30 per person (prices increase after 12/25). Enjoy live country artists on the first floor and live acts and a DJ playing country hits on the rooftop. This event is 21 and over only. Cowboys & Countdowns Only – $30 in advance | Get more details. Tin Roof on Demonbreun is hosting a New Year’s Eve party on Monday, December 31, 2018, starting at 8:00pm. General admission is $30 at the door and includes party favors, a champagne toast at midnight, and music by Jet Black and the Cadillacs. VIP tickets are available for $150 and include an all-inclusive bar from 9:00pm to 1:00am, plus green room access, side stage access, and a private entrance. You can also reserve a booth for six people for $200. This event is 21 and over only. $30 GA / $150 VIP | Get more details. 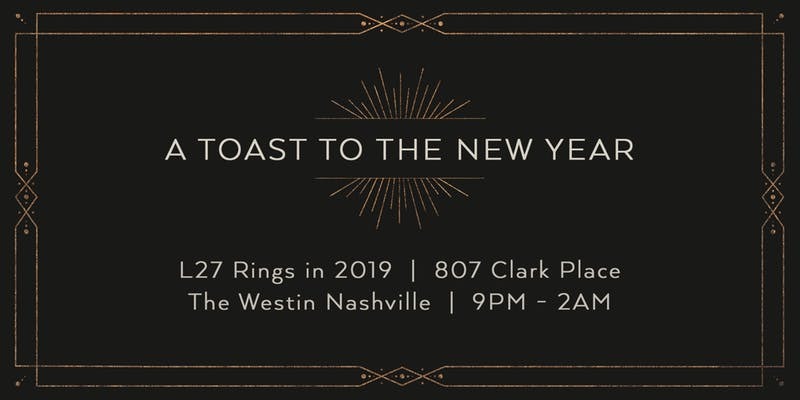 Ring in the new year in the New Era Ballroom at Woolworth on Fifth on Monday, December 31, 2018, from 7:00pm to 1:00am. 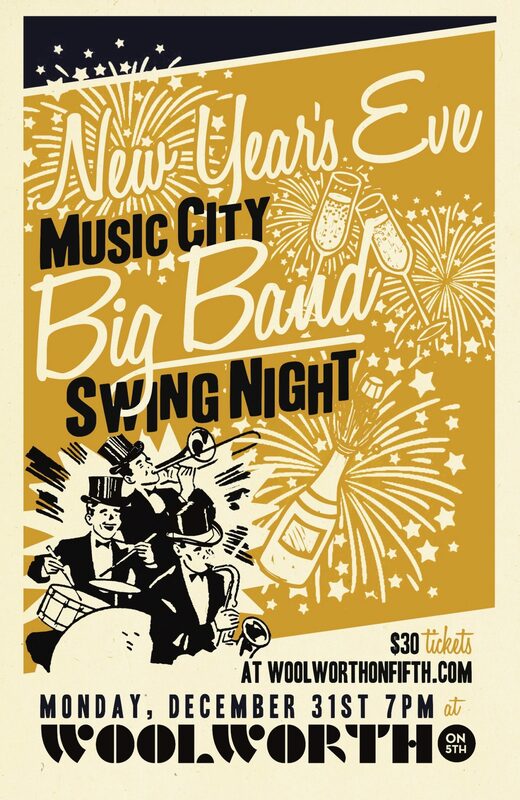 The Music City Big Band will perform and dance instructors will be onsite to help you dance the night away. A champagne toast will be available to all ticket holders. There’s also a “Dinner & Dance” option for $85, which includes a prix-fixe three-course dinner service. $30+ | Get more details. 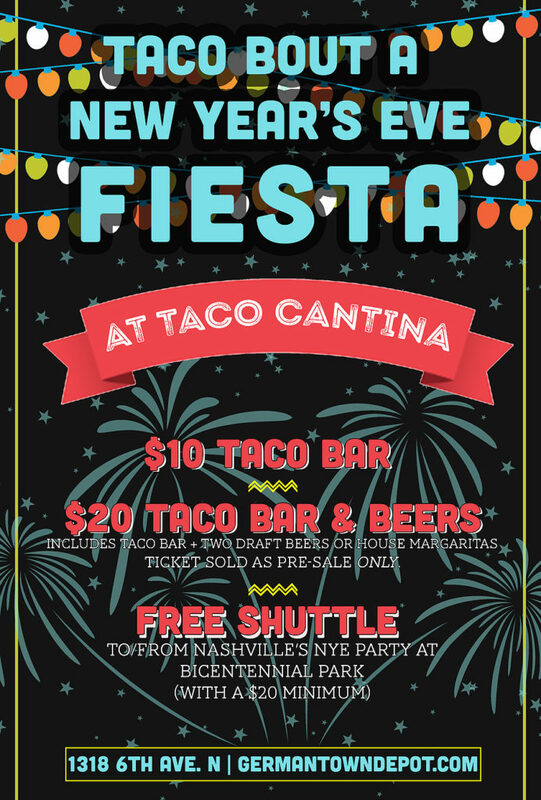 If you’re going to Jack Daniel’s Music City Midnight (the city’s main event), take advantage of this option at Germantown Depot’s Taco Cantina on New Year’s Eve between 5:00pm and 3:00am. There will be a taco bar, drinks, and a free shuttle to and from Bicentennial Park (you must spend $20 or more for shuttle access). Tickets are $20 for the taco bar plus two drinks (draft beers or margaritas) or $10 for the taco bar only. $10+ | Get more details. Famous Saloon’s New Year’s Eve Glow Circus is Monday, December 31, 2018, from 7:00pm to 2:00am. 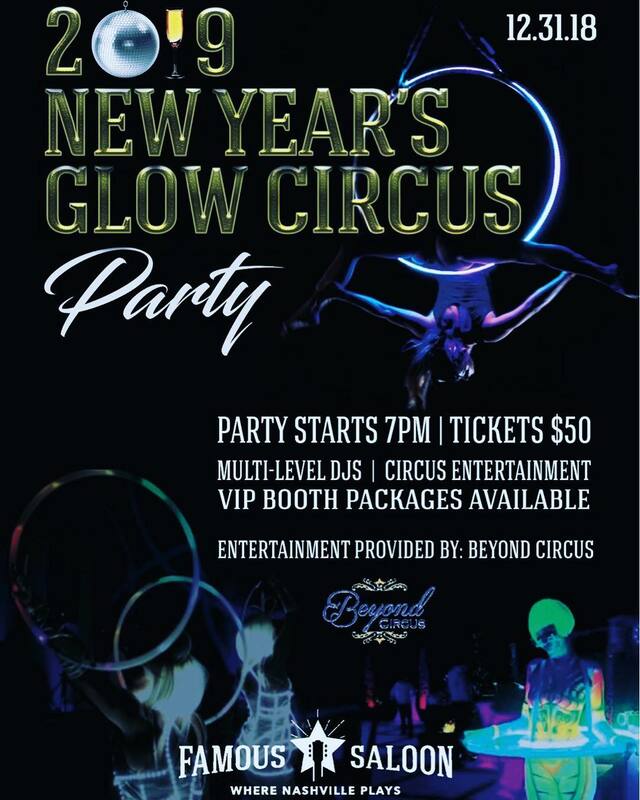 Beyond Circus will provide entertainment, ranging from aerial champagne dancers to stilt walkers to jugglers. DJ Hish and DJ Danny Lewis will provide music all night. Enjoy downtown views from the rooftop! Every ticket includes admission, a champagne toast, and party favors. General admission tickets are $50. VIP booths are also available. Tin Roof Broadway is hosting an NYE celebration on Monday, December 31, 2018, from 9:00pm to 3:00am. 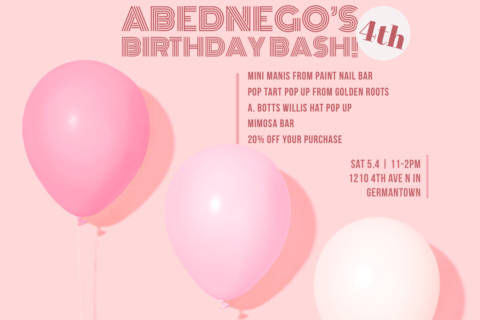 There will be live music, party favors, a champagne toast, and more. General admission at the door is $15 (depending on capacity). Purchase tickets in advance for guaranteed admittance, or upgrade to VIP for an all-inclusive option from 9:00pm to 1:00am. If you have a group of 4 or more, consider a booth rental! 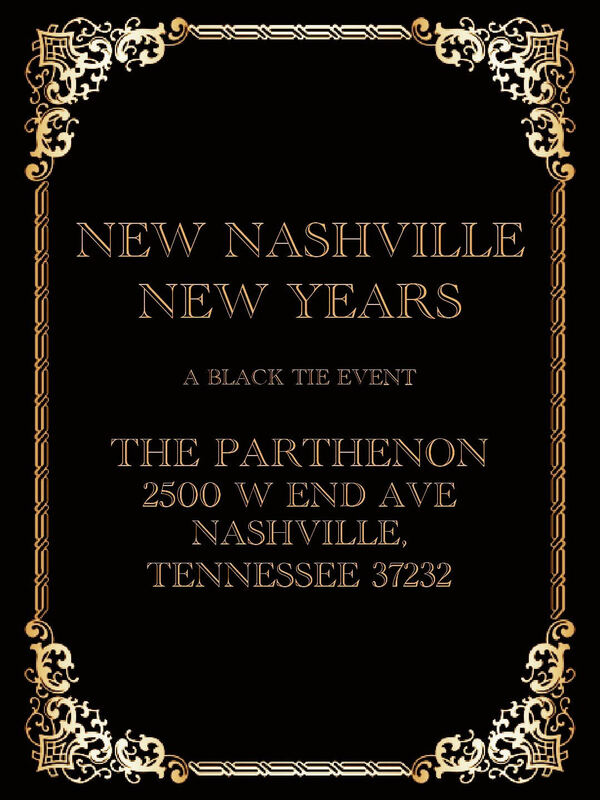 The inaugural New Nashville New Year’s Celebration is Monday, December 31, 2018, from 9:00pm to 1:00am at The Parthenon. Dress to impress for this black-tie NYE event! Attendees can expect access to the Parthenon’s art museum, an open bar all night, and a midnight champagne toast. Upgrade your experience for Dom Perignon champagne or a VIP table for your group. Tickets start at $150. This event is 21 and over only. L.A. Jackson, Thompson Hotel’s popular rooftop destination, is hosting Midnight Hour on Monday, December 31, 2018, from 9:00pm to 2:00am. Tickets are $300 and include a complimentary bar, champagne toast at midnight, late-night breakfast, and DJ sets by KO and Warfield. $300 | Get more details. 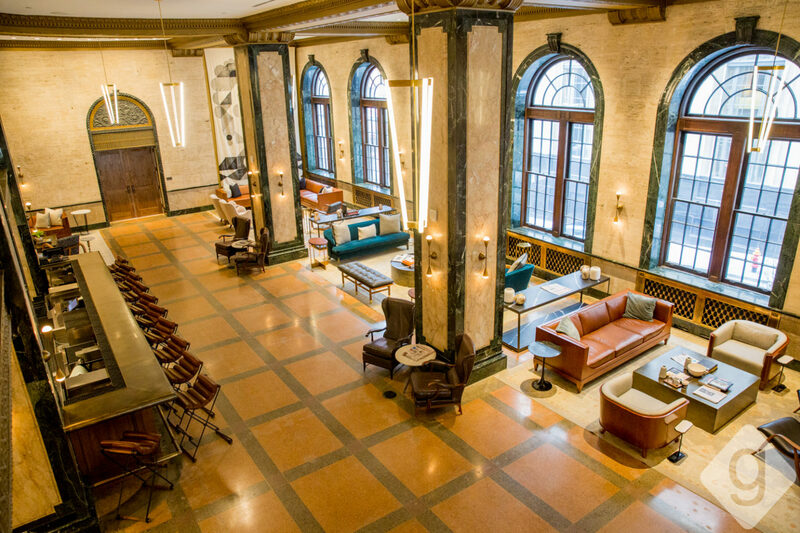 Super Cool New Year’s, an upscale New Year’s Eve party, is Monday, December 31, 2018, from 9:00pm to 2:00am at Trimble House. 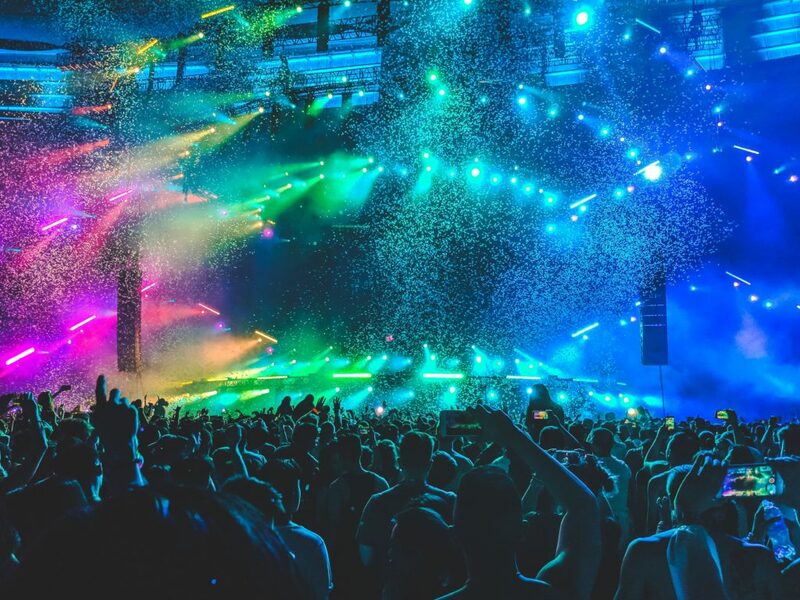 The all-inclusive, Ibiza-style event includes a premium open bar (cocktails, craft beer, champagne, and wine), catered party bites, LED party favors, DJ, and dancing. The evening will start with a cocktail party from 9:00pm until midnight followed by a a champagne rave when the ball drops. Tickets are $95-$150, depending on when you purchase. Buy early to save. Upscale cocktail attire and LEDs are strongly encouraged. This event is 21 and over only. $125-$150 | Get more details. Avary Entertainment and Jagermeister present: 2019 NYE at The Back Corner on Monday, December 31, 2018, starting at 9:30pm. The all-inclusive night (including taxes and gratuity) will feature an open bar, photo booth, party favors, balloon drop, and performances by KDSML, KHAOS, Mike-III, and special guests. Tickets are $150 to $200. This event is 21 and over only. $150 | Get more details. Shindig Mafia is hosting their annual Shindig Mafia’s New Year’s Eve Soirée at The Standard from 8:00pm to 2:00am on Monday, December 31, 2018. Enjoy a night of champagne, live music, and dancing. The Willies will be playing live swing and blues music. Tickets include unlimited complimentary champagne until midnight and a breakfast bar. $100+ | Get more details. Big Night Nashville New Year’s Eve Gala is on Monday, December 31, 2018, from 9:00pm to 2:00am at Gaylord Opyrland Resort. The event feature themed ballrooms, dance floors, DJs, party bands, party favors, and more. All-inclusive VIP upgrades are also available starting at $189 per person. $49.99+ | Get more details. The annual Fire Ball New Year’s Eve returns on Monday, December 31, 2018, from 9:00pm to 2:00am at W.O. Smith Music School. The all-inclusive event features a top-shelf open bar, live music from BandLux & DJ Benji, hors d’oeuvres, a breakfast buffet at midnight, a photo booth, and a courtesy shuttle to various neighborhoods. This is a black-tie (optional) event for anyone over 21. The Ainsworth, one of Nashville’s newest additions, is hosting NYE The Great Gatsby on Monday, December 31, 2018, from 8:00pm to 3:00am. Tickets include all-inclusive drinks, dinner buffet, and a midnight champagne toast between the hours of 8:00pm and midnight. A VIP upgrade is also available. Ring in the new year at Hard Rock Cafe, on Monday, December 31, 2018, from 9:00pm to 2:00am. All ticket holders can enjoy an all-inclusive experience including a DJ, heavy appetizers, premium open bar, party favors, and a champagne toast at midnight. VIP upgrades are also available. $125+ | Get more details. Black Tie Ball is Monday, December 31, 2018, from 10:00pm to 2:00am at the JW Marriott’s rooftop bar, Bourbon Sky. The evening will feature a DJ, dance floor, signature hors d’oeuvres and canapés, complimentary champagne, and decadent desserts. General admission is $300 and VIP access to the Terrace is $400 (limited to 50 guests). $300+ | Get more details. Freaklesque presents: Transformation, a time-traveling freak show, on Monday, December 31, 2018, from 9:00pm to 2:00am at Little Harpeth Brewing Co. Guests can expect live music, burlesque dancers, an aerialist, a snake charming, and other jaw-dropping performers. This event is 21 and over only. Moon Taxi will continue their Good As Gold Tour on New Year’s Eve at the Metro Nashville Municipal Auditorium. Show starts at 9:00pm. $31.50–$56.50 | Get more details. My So-Called Band is the act to see if you love 90’s music. 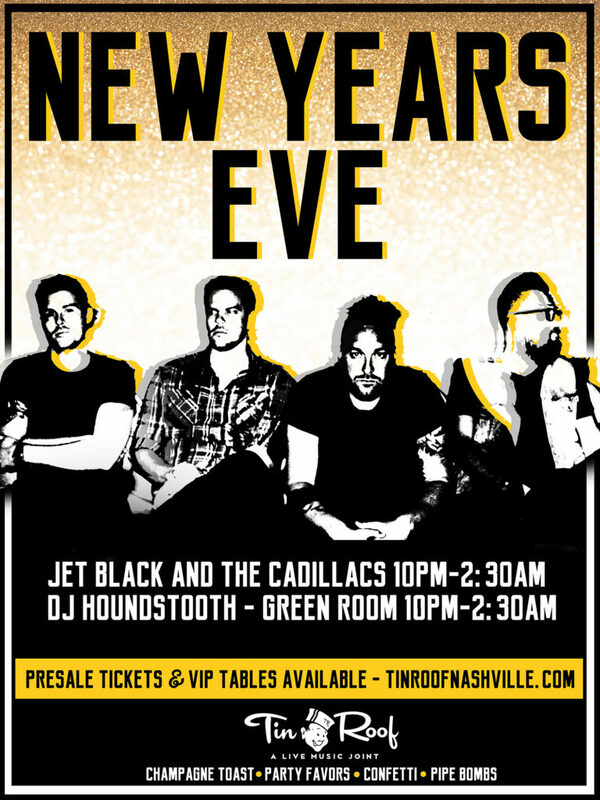 They’re playing at Cannery Ballroom on New Year’s Eve. Show starts at 9:30pm. $35–$45 | Get more details. Old Crow draws quite the crowd, and they’ll play NYE night at the intimate Ryman Auditorium. Show starts at 9:00pm. $59.50–$99.50 | Get more details. Join John Prine, Nathaniel Rateliff and the Nightsweats, and special guest Iris DeMent at one of Nashville’s most iconic venues. Show starts at 8:00pm. $81.50–$265.50 | Get more details. Papadosio will be performing at Marathon Music Works on New Year’s Eve. Show starts at 9:00pm. $20–$75 | Get more details. Ring in the new year with Purple Masquerade, a Prince Tribute Band. Show starts at 10:00pm. $23–$45 | Get more details. If your heart beats to the sounds of the 80s, Guilty Pleasures at 3rd & Lindsley might be your Nashville NYE go-to. Show starts at 8:00pm. $25 | Get more details. If you want to wine and dine on New Year’s Eve and catch a concert at the same time, City Winery is the place to be. Marc Broussard is playing an early show at 7:00pm and a late show at 11:00pm. All ages may attend. $45–$68 | Get early show details and purchase tickets. | Get late show details and purchase tickets. The Weeks are teaming up with Southern Grist to throw a “Lager in the Night” New Year’s Eve Party. Doors open at 9:00pm. $30–$100 | Get more details. If you enjoy country and western-tinged pyschobilly, make your way to see Unknown Hinson at Exit/In on New Year’s Eve. Doors open at 8:00pm. $15–$25 | Get more details. Etch’s New Year’s Eve dinner is Monday, December 31, 2018, from 4:30pm to 10:30pm. The four-course prix-fixe menu is $90 per person with optional wine pairings for an additional $40 per person. $90 | Get more details. 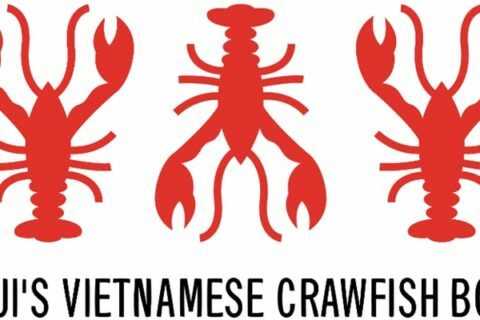 Little Octopus in the Gulch is hosting a New Year’s Eve dinner on Monday, December 31, 2018. The prix-fixe menu includes a truffle dumpling, glass of champagne, shareable plates for the table, one entree, and a dessert. The cost is $75 per person. An optional seafood tower is available as an add-on. $75 | Get more details. Sambuca NYE will feature a three- or four-course dinner, live music by Grant Garland, and a midnight champagne toast on Monday, December 31, 2018. Dinner seatings are available at 5:00pm, 7:00pm, and 9:30pm. The cost is $45–$130 per person. $45–$130 | Get more details. Southernaire Market’s New Year’s Eve dinner is Monday, December 31, 2018, from 6:30pm to 9:00pm. The five-course Korean fusion tasting dinner created by Chef de Cuisine Jeremy Wyatt will blend flavors of South Korea and the Southeast paired with festive cocktails. The cost is $75 per person. Join chef Deb Paquette at Etc. in Green Hills for a special NYE dinner on Monday, December 31, 2018, with seating between 4:30pm and 10:00pm. 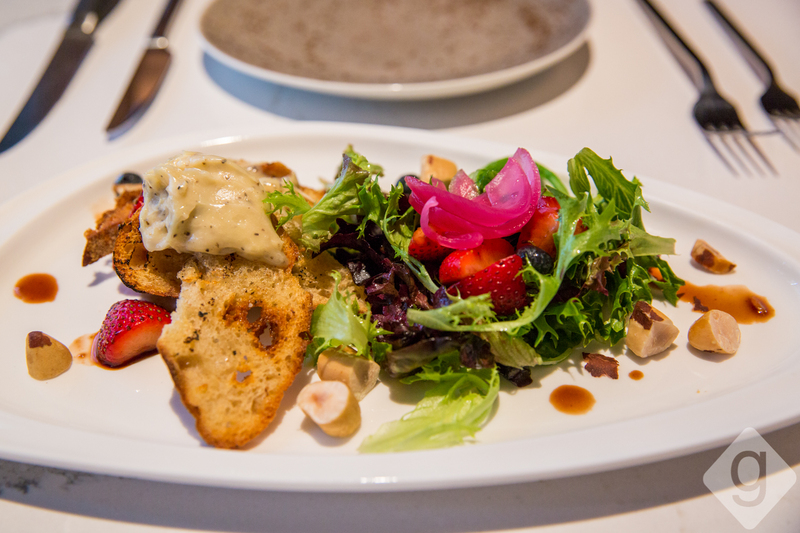 The four-course prix-fixe menu is $80 per person with optional wine pairings for an additional $30 per person. $80 | Get more details. Sinema’s “Draped in Decadence” dinner is Monday, December 31, 2018, with seatings from 5:30pm to 9:45pm. The five-course dinner is $90 per person with optional wine pairings for $40 per person. Upgrade your ticket for an additional $35 to get access to the Carnival Lounge Party upstairs from 9:00pm to 1:00am featuring DJ Suspense and Pappy’s Photo Booth. If you just want to attend the lounge party, tickets are $50. Guests are encouraged to dress in full masquerade attire (including masks). Chef de Cuisine Paul Brantley is preparing a special three-course menu at The Southern Steak & Oyster on Monday, December 31, 2018. The cost is $75 per person. Join Henley on Monday, December 31, 2018, between 5:00pm and 10:00pm for a special dinner prepared by chef Daniel Gorman. Choose from one of three prix-fixe menus, available at $75, $85, and $115. $75–$115 | Get more details. On New Year’s Eve, venture to The Green Pheasant in SoBro between 5:00pm and 9:30pm for a multi-course tasting menu of Japanese dishes. The dinner is $75 per person plus tax and a $15 service charge. Optional sake pairing are also available. $90+ | Get more details. Chauhan Ale & Masala House will have a prix fixe four-course menu prepared Maneet Chauhan on Monday, December 31, 2018. The cost is $75 per person with an optional $45 beverage pairing. Geist in Germantown is hosting a New Year’s Eve dinner on Monday, December 31, 2018, with a caviar amuse and four courses. There are two seatings at 6:30pm and 9:30pm. The cost is $75 per person. The Mockingbird in The Gulch will have a prix fixe five-course menu on Monday, December 31, 2018, from 4:00pm to 10:00pm. The cost is $75 per person with an optional $45 beverage pairing. Lyra is offering a four-course dinner on New Year’s Eve, Monday, December 31, 2018, with an optional wine pairing and craft cocktail feature. The cost is $65 per person. $65 | Get more details. For New Year’s Eve, The 404 Kitchen is offering either a 3-course menu from 5:00pm to 7:30pm for $105 with champagne pairings ($75 without) and a 5-course menu from 7:30pm to 10:00pm for $175 with champagne pairings ($125 without). $75+ | Get more details. Tansuo will have a four-course prix-fixe menu on New Year’s Eve. The cost is $80 per person with an optional $45 beverage pairing. The contemporary Chinese meal with be served family style. Nicky’s Coal Fired is hosting a retro-inspired New Year’s Eve dinner on Monday, December 31, 2018, featuring a four-course tasting menu, plus a martini cart to toast the New Year. The cost is $60 per person. $60 | Get more details. Fort Louise is offering a three-course prix-fixe dinner for $55 per person from 5:00pm until 10:00pm on New Year’s Eve. Call or make a reservation online. $55 | Get more details. Capitol Grille inside The Hermitage Hotel is serving a prix-fixe menu–including amuse, three courses, an entree, dessert, and a glass of sparkling wine–on New Year’s Eve. Seatings are available at 5:00pm, 7:00pm, and 9:00pm. A live trio will also perform. The cost is $100 per person. Taxes and gratuity are not included. $100 | Get more details. Bourbon Steak is offering a prix-fixe, three- or five-course meal. The three-course dinner is $125 per person with seatings at 5:00pm, 5:30pm, and 6:00pm. The five-course dinner is $175 per person with seatings at 8:00pm, 8:30pm, and 9:00pm. Bourbon Sky lounge is also open to the public from 4:00pm to 9:00pm. $125–$175 | Get more details. New Lyft users get $15 towards your first 3 rides ($5 per ride) using the NashvilleGuru promo code. 7 Comments on "New Year’s Eve in Nashville 2018-2019"
Are there any bars downtown with a patio or outdoor area where you can hear/see the bash on broadway but don’t have to spend all evening outside if you don’t want to? Is there a place where we can listed to the bash on Broadway and not spend all of our time standing outside. Doesn’t have to be free. What are covers like for bars up and down broadway for the Nye party outside? 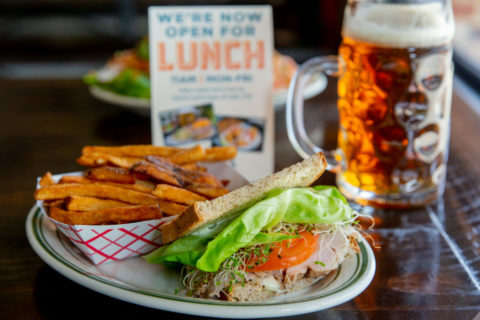 Are there any dining spots that will take reservations, but will offer a full menu? do folks dress up for concerts on NYE? Need recommendations for NY Eve Parties that have seating. Don’t mind paying $$$ for it. Wanted to do the Dueling Pianos, must buy a table for four, only two of us.